Of all the jobs that we do on the farm, the one that puzzles people the most, the one that causes head shaking, the one that is least understood, is fruit thinning. Since growing fruit is our business, why would we deliberately remove fruit – sometimes lots of fruit – from the trees. We’ve been called crazy (or worse) & it’s been suggested that we have lost our minds when people see us thinning the fruit trees. But there are good & sound reasons for thinning fruit. Often a tree will set a lot of fruit – more fruit than it is capable of growing to a marketable size. So we remove a portion of the crop. We thin both for tree & for the fruit. A too large crop could cause the tree to use all its energy to bring the fruit to maturity, leaving it without the necessary strength to keep growing. If there are added stresses such as hot & dry weather or too much rain, insects or diseases … the tree could die. Additionally, the weight of all that fruit could cause branches to break. Too much fruit also means smaller fruit. It is preferable to have less but larger fruit – they look better, sell better & are worth more money. And so we thin. 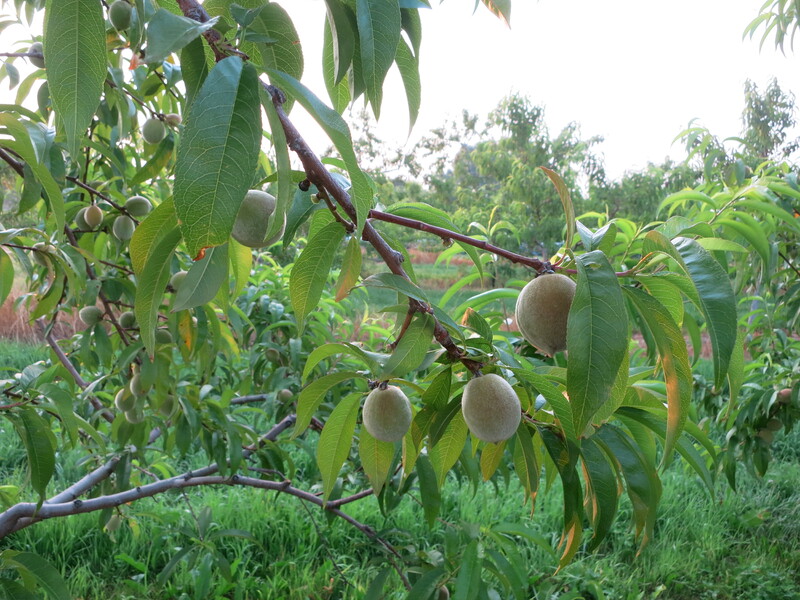 On our farm we thin pears & peaches almost every year & often plums too. But all fruit can benefit from thinning if the crop is heavy – pears, peaches, nectarines, plums, apples, grapes & even cherries. Before we thin we wait for the tree to do its own thinning. It’s called the June drop. 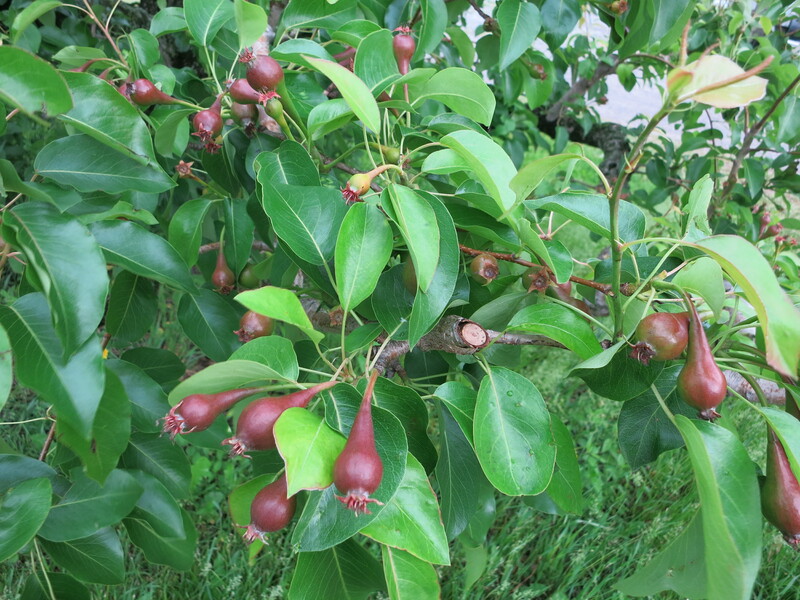 Most trees will drop a portion of their crop in mid-June – often fruit that is deformed or not properly pollinated, or just because there is too much! If we thin before the tree does its thing, we risk losing more fruit than we want. But when we see little fruit scattered under the trees we know we can safely finish the job. 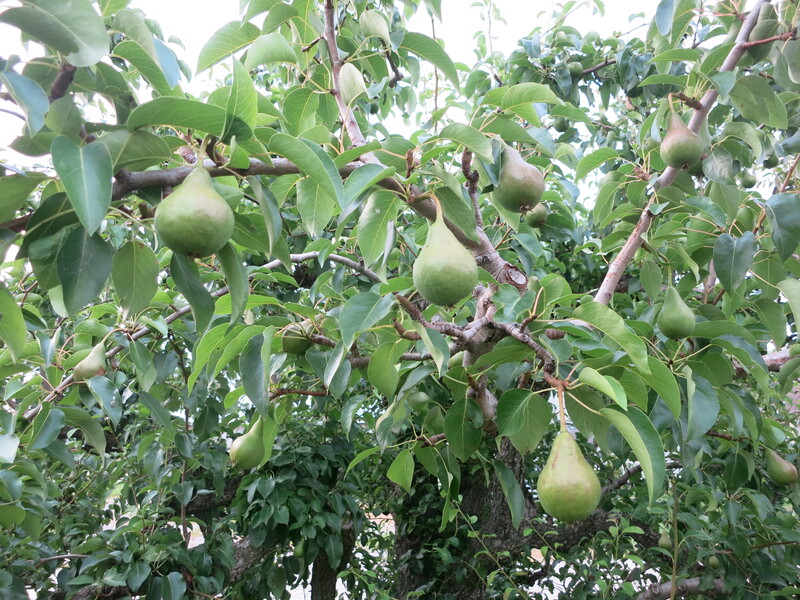 Large pears are what the market wants, and they grow slowly, so we thin them first. We use small clippers to cut the pears off & try to space them about 8 or 9″ apart on the branch. Yes, it’s a slow & somewhat tedious job! Peaches are easier to thin as they can be flicked off with your thumb & index finger. (The issue with peaches is the fuzz. The peach fuzz builds up between your fingers, in your elbows & especially in your neck. Mix it together with sweat on a hot, humid day & things can get rather itchy to say the least). The early maturing peaches that ripen before the middle of August don’t have as long to grow so we thin them about 8 or 9″ apart. We don’t thin the earliest varieties until their pits have hardened. Peach pits are soft & juicy until about the end of June when they begin to solidify & turn hard. If we thin before this happens, the pits will split apart as the peach grows and the peach will be open at the stem end allowing rain to enter & the fruit will rot. Insects will also take advantage of the opening & move in. Timing is critical! 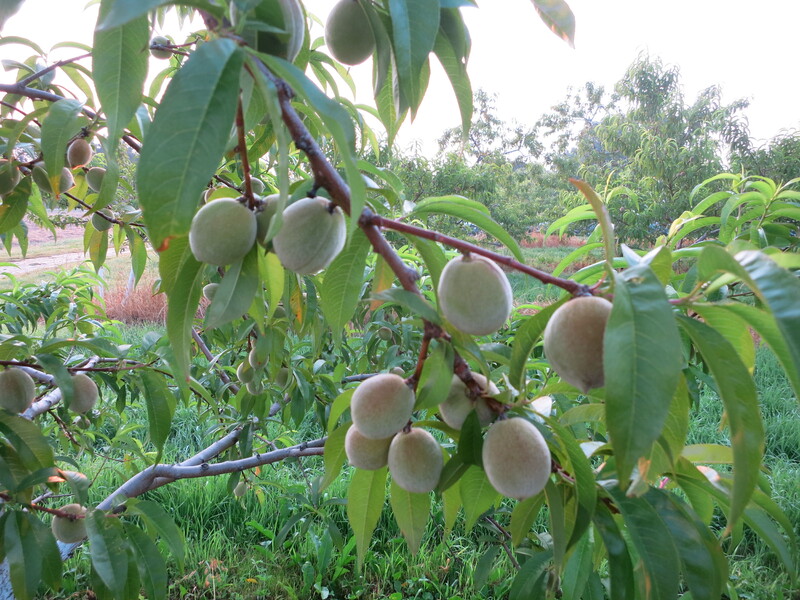 Later peaches have longer to achieve their size so we thin them about 6″ apart on the branch. 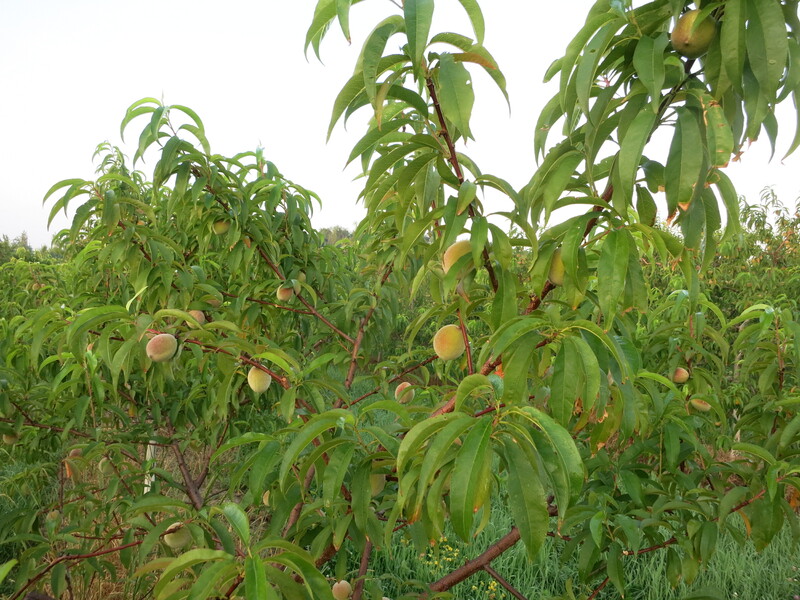 When the crop is especially heavy, some farmers will use plastic baseball bats or pieces of hose to break the clumps of peaches, and follow with hand thinning. We just use our hands – it’s too easy to get carried away with a hose & whack the whole crop off! Thinning can be done by feel – it’s almost not necessary to even look at the tree. But a good thinner will look at the fruit & try to remove the smallest, the blemished & misshapen fruit. 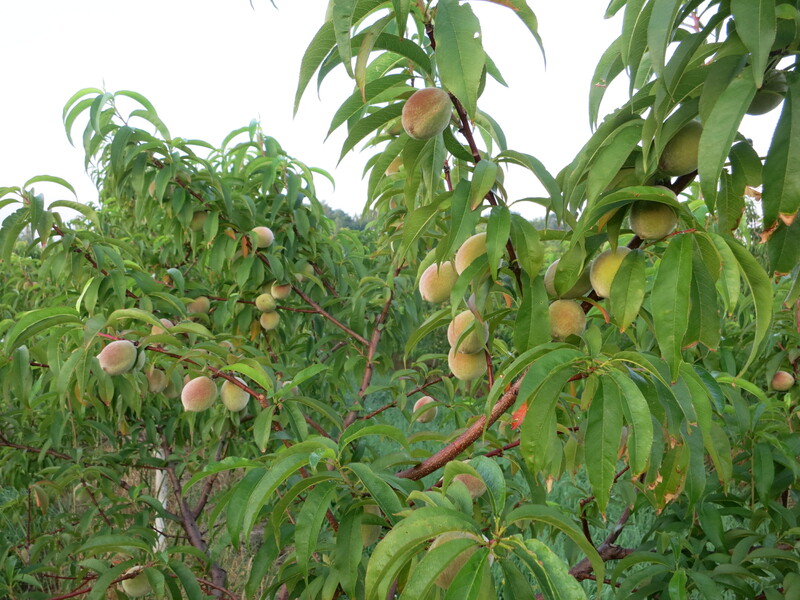 We try to finish our peach thinning by mid-July. This season we are a bit behind, as all hands have been busy picking cherries & now raspberries. But we’re hoping to catch up soon. Everyone is anxious for big, sweet, juicy & delicious peaches! Raspberries, broccoli, lettuce, zucchini, beets (red or golden), garlic scapes, basil plants. Raspberries are at their peak this week, so expect more of these sweet, red & delicious berries in your share. This is the 4th week for broccoli – and maybe the last. We hope you are still enjoying it. Has it been too much or just enough? We have included a recipe below for broccoli slaw courtesy of one of our CSA members (thanks Shelley!). The lettuce is tasting good so it’s part of the box again this week. Back at the end of May we had that frost that damaged the zucchini and set them back. Well, the plants that made it through are starting to produce now so there is finally zucchini (green, yellow, striped or patty pan) in the box. We will have beets this week. When we pick tomorrow we’ll see if they are red or orange or a combination. Garlic scapes are a favourite for many. They are the top of the garlic plant. We cut them off so the garlic puts all it’s energy into forming a nice big bulb underground. Leaving the scapes to grow would produce flowers & seeds instead, which we don’t need or want. Use them wherever garlic bulbs are used – raw or cooked. Their flavour is a bit milder than garlic. We have included our recipe for garlic scape pesto – a favourite of garlic lovers! Back in spring when we were offering herb plants, many of you asked for basil plants. Finally we are having basil weather – hot & sunny – so we will have basil plants available for those who want them. Plant them in the garden or in a larger pot, or just cut & use the plant as is – your choice! Trim and peel broccoli stalks; chop coarsely. Cut florets into small pieces. In a large bowl, stir together broccoli, onion, celery and red pepper. Whisk together vinegar, oil, sugar, paprika, salt and pepper. Continue to whisk until sugar melts and dressing thickens slightly. Pour dressing over broccoli mixture; toss well. Refrigerate salad, covered, for at least 4 hours or up to 24 hours. Just before serving, add sunflower seeds (if using). Toss well. Puree scapes, olive oil, & lemon juice in a blender or food processor until nearly smooth. Gently stir in cheese. Taste & adjust juice & salt to taste. Serve as a spread on bread or crackers, a dip for vegetables, or on pasta or pizza. Store in refrigerator for 2 -3 days. Pesto can be frozen for longer storage. Thank you for returning all boxes & containers! Please do not leave your vehicle idling while you pick up your CSA box.